Biscuits, meaning twice baked, are a common ration for sailors on the high seas. They are first baked in a hot oven and then dried out in a slow oven. The resulting biscuits are hard, practically indestructible cookies. Biscuits are filling, easy to store, easy to carry, and long lasting. They are not known for their flavor. In addition, sailors would claim that they're barely edible and that biscuits have to be soaked in water to soften them up enough to chew. Worms are an issue too. So it is best to break them and pick out any unwanted additional protein. Brandy is an alcoholic spirit most commonly produced by distilling wine. After distillation, the brandy is aged in wooden casts which gives it a caramel color and a smokey flavor. It can be drunk straight, mixed with other liquids, or used in cooking. Brandy can be made from fruits other than grapes. Pear is the most common, but apple and honey are popular too. The fruit flavor is light, and the resulting spirit is clear. 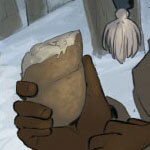 Colonists in Aradie are experimenting with making brandy from maple syrup. As a spirit, brandy is the Sophic Mercury of the fruit from which it is formed. The spiritual essence of the fruit causes a pleasant feeling of warmth when the spirit is imbibed. However, if too much of this Sophic Mercury is ingested, the imbiber can become ill, as an abundance of the spirit will unbalance the humors. Brandy is a trade good that is popular among the natives of Everique. However, their reaction to the Sophic Mercury contained in brandy is greater than that of Japethans, and if they imbibe great amounts of the spirit, they can lose control of their body and cause great damage to life and property around them. Voyageurs and coureurs des bois have noticed they have a similar response to brandy in the depths of the Everique wilderness. The Governor General tightly restricts how much brandy is sold through the course of the Fur Trade. Canoes are inspected before they head into the wilderness to ensure that the embargo is maintained. Naturally, smuggling is rampant. Chocolate is an exotic import from the continent of Ascuta. The beans of a cocoa plant are ground into a paste and milk, sugar, eggs, and spices are added to the mix to create a pleasing drink that is served hot. In fact, chocolate is only served as a drink. If found as in a solid state, typically as wafers, it is solely for transport, and the wafers are intended for dissolving in a liquid and not eaten directly. Drinking chocolate is believed to have nutritious, medicinal, and even aphrodisiac properties, and is noted for fighting fatigue. Many philosophers prescribe it as medicine. The natives from Ascuta originally discovered the cocoa bean, which they ground into a paste and mixed with corn mash, spices, water, and chiles and frothed into a bitter drink. The natives believed it be powerful medicine with divine properties. When the Ilandrians began their exploration of Ascuta, they found the drink to be bitter and unappealing, but when the chiles were replaced by honey or cane sugar they found it very palatable. They continued to use a wooden whisk created by the Ascutans called a molinillo (moussoir in Saronne) to make chocolate frothy and create foam. 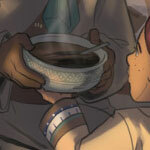 The Saronnans later invented the chocolatière, a copper pot that makes it easier to prepare and pour the drink. Chocolate as a drink spread from Ilandria to Saronne with the marriage of Princess Isabel to Raimon IV. When she arrived, she brought a chest full of cocoa beans as a gift to her husband, who developed a taste for the drink. Because of its expense, chocolate became associated with wealth and nobility. With philosophers touting the health benefits of the drink, soon everyone wanted the hot rich drink of kings. With chocolate's exploding popularity, Saronne, Morante, Kleef, and the Freeports of the Kennard Reach established their own colonies in Ascuta to challenge the Ilandrian monopoly of the cocoa bean. As cultivation of the bean has spread, increasing supply and decreasing the price, chocolate houses have begun popping up in cities throughout Japethe. Preparation of chocolate is labor intensive, so a dedicated shop could more efficiently make the drinks. There are currently more than a hundred chocolate houses in Arcaneaux alone. These shops became social centers and places of discourse. Philosophical societies often make chocolate houses their meeting place and university students gather there after classes are done. Some of the more notorious chocolate houses have a reputation for being hotbeds of sedition. 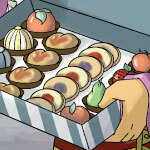 The three primary types of confection in Aradie are comfits, marzipan, and sugarplums. Comfits are small treats that consist of a hard candy shell around a nut. These candies are made possible by the recent discovery of panning sugar. A nut, usually an almond, is coated with a sap and then tossed in a pan that is heated with steam. The pan is rotated at an angle, while liquid sugar is poured over top the nuts. Some of the sugar adheres to the nuts and is cooked to a hard shell after which it is allowed to dry. The process is repeated again and again over the course of many days with each layer of sugar building onto the last until the comfit reaches the desired size. Often times the sugar is colored to give the comfits a rainbow of appearances. The manufacture is labor intensive, making them frightfully expensive and a status symbol for the wealthy. Marzipan is a mixture of sugar, honey, and almond paste. The resulting confection has the consistency of soft dough and is incredibly versatile. A skilled confectioner can coax fantastic shapes out of marzipan. It can be rolled out into sheets, shaped into objects, cut into intricate designs, or molded into candy. Marzipan is often used to decorate baked goods, most often cakes. Its pliable texture and sweet, nutty flavor make it a popular treat, while its inexpensive ingredients make it affordable for people of all walks of life. Sugarplums are small round balls made of dried fruit, nuts, spices, and honey. The fruit used changes depending upon the recipe and what is available, but commonly includes apricots, dates, and plums. The nuts are usually almonds but are sometimes pecans. The fruit and nuts are diced and mixed with honey and spices. The spices vary widely depending upon the recipe, but cinnamon, orange juice, and orange zest are one popular combination, as is a medley of anise, fennel, caraway, and cardamom. The mixture is then separated into bite-sized dollops, each of which is rolled to form a ball. With the recent abundance of sugar imported from the tropics, confectioners sometimes roll the sugarplums in coarse sugar to add a satisfying crunch to the treat. A hot toddy is a mixed drink of whiskey, honey, lemon juice, water, and spices. It is served warm, making it popular during cold or wet weather. The mixture helps with congestion and is a cure for the cold and the flu. The recipe originated in the Kennard Reach, but the colonists in Aradie adopted it eagerly and it can be found in most taverns and saloons in Sherbourg. 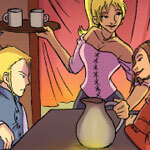 Because of an exemption made to guild laws early in the colony, hot toddy is the only drink allowed to be made and sold by the Hostelers' Guild. Hot toddy can be made in single servings, but it is much more commonly made in large pots and then ladled out into individual mugs. Heat water to boiling and combine with whiskey. Add honey, lemon juice, and cloves to mixture. Stir to combine and honey is melted. Allow to steep for three to five minutes. Garnish with cinnamon stick. 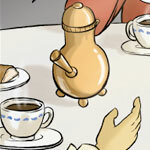 If tea is available, that is sometimes used to replace the water. As with punch, we ask that you drink responsibly and abide by the laws of your community. For a non-alcoholic version of the drink replace the whiskey with apple cider. Oysters flourish in the shallow waters of the eastern coast of Everique, from the Gulf of the Grand Vire in the north to the Messeteague Bay in the south. They are so abundant that the ships must steer clear of the oyster banks for fear of running aground. If left unharvested, they can grow to enormous proportions - some even reaching nearly a foot long. In very shallow waters, such as the banks of the Grande Vire River near Sherbourg, oysters are gathered by hand or rake. In deeper water, such as out in the gulf, oystermen use long-handled oyster tongs to reach the beds. The natives of Everique made oysters a large part of their diet for centuries before the arrival of settlers from Japethe. 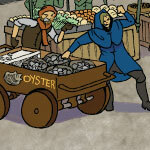 For the colonists in this new world, oysters were an indispensable necessity for survival in an untamed land. Many of the early colonies subsisted almost entirely on the shellfish for their protein in late winter when other supplies were running low. Even now, oysters are common fare in the streets of Sherbourg and other colonial cities. Their ready supply and ease of gathering make them cheap meals, and oystermen push carts of oysters packed in ice through the streets. Colonists of Sherbourg enjoy their oysters many different ways - raw, smoked, boiled, baked, fried, roasted, stewed, pickled, steamed, and broiled. If eaten on the half shell, they are served with lemon juice, horseradish, or shallot vinegar. Virtually all oysters are transported alive in the shell, and shucked or steamed open when needed for the table. If not eaten immediately, oysters are most often preserved by pickling. The shells, which are rich in lime, are used as fertilizer or ground and used to pave the streets in the poorer sections of Sherbourg. Mix the shallot with the vinegar. Add horseradish if desired. Allow mixture to sit for at least an hour preferably 6 hours. Hold each oyster in either a tea towel or while wearing a sturdy glove. Open each oyster by working an oyster knife into the hinge until it pops. Sweep along the inside of the shell with the knife to cut the abductor muscle. Remove the top shell. Spoon the shallot vinegar mixture onto the oyster. Give a quick squeeze of lemon onto the oyster if desired. Pemmican is a nutrient-rich food that keeps and travels well. It is a creation of the natives of Everique but was quickly adopted by the voyageurs and other Japethan explorers. Pemmican is a combination of game — usually deer, rabbit, moose, or buffalo — and melted animal fat. The meat is sliced thin and dried over a low fire. Rice, herbs, and dried berries, such as blueberries and cranberries, are added to give texture and flavor. The potato is a starchy tuber that is native to the continent of Ascuta and has spread to Everique in the north through trade. It is a popular food source for its hardiness and ease of cultivation. The potato grows in a wide variety of climates and soils and produces a great deal of food with little effort. Storage of the potato is an issue as they are prone to rot when pulled from the ground. For this reason, potatoes are often left in the ground unharvested until needed. The potato is related to nightshade and is widely believed by ignorant Japethans to be poisonous. In their defense, the tubers produce stalks that are toxic that grow into low bushy shrubs with leaves that are toxic, which in turn produce small fruits that are also toxic. In fact, the only part of the potato plant that is not toxic is the tuber itself. Attempts to get the farmers of Aradie to grow potatoes and diversify the harvests has been met with staunch resistance from the colonists, who prefer their tried-and-true wheat. However, potatoes are more suitable to the colder clime of northern Everique, so practicality will likely win out in the end. The hard beverage of choice in Sherbourg is punch. Since Sherbourg is a port town, rum and lemons are readily available from the southern colonies, adding to the drink's popularity. Also, the grapes and grains needed to make wine and beer are not plentiful in the cold wilderness of Acadie. Punch is most commonly served in bowls to a group of drinkers at the table who ladle out the amount they wish to drink (a process called fathoming). The bowls can range from crockery to silver to ornate crystal. Punch is sometimes served in pitchers without a ladle at poorer establishments in Sherbourg. Lemons to make it sour; and sugar to make it sweet. 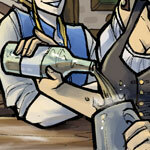 Every saloon, club, military unit, and guild in Sherbourg has its own version of punch. The clubs, guilds, and the military consider their punch recipes a highly prized secret that they only reveal to their members. The ingredients for saloon punches tend to be commonly known. Here is the recipe for the punch at the Harp and Trumpet. Be careful; it is potent stuff. And even though Sherbourg's drinking age is quite low (You can see over the bar? Here you go! ), we ask that you drink responsibly and abide by the laws of your community. Mix first four ingredients until sugar has completely dissolved. Add spices and stir. Serve cold or poured over ice. For a non-alcoholic version of this punch, replace the rum with orange juice. If you don't want to juice that many lemons, replace the lemon juice and sugar with lemonade. Depending upon how sweet your lemonade is, you will have to adjust proportions. You can also substitute allspice for the cloves. Or even add tea to the mix. Punch is designed to be customized so feel free to experiment. The Three Sisters are maize, beans, and squash — three agricultural plants that grow well together. In combination, they provide enough nutrition to sustain health. The three sisters form the foundation of the diet for most of the nations of the Lakelands of Everique, including the Liranequois and the Elakanois. So entwined are the three plants that their spirits are seen as sisters, each benefiting the other while receiving something in return. Maize provides most of the nutrition. The beans round out the maize and replenish the soil. The squash shades the soil, keeping it moist, choking out weeds, and deterring pests. The natives have developed a style of agriculture that philosophers call companion planting. The maize is planted first. After the cornstalk has had a chance to grow, the beans are planted. The vines of the beans will then climb the cornstalk. Finally, the squash seeds are planted in order to provide ground cover.